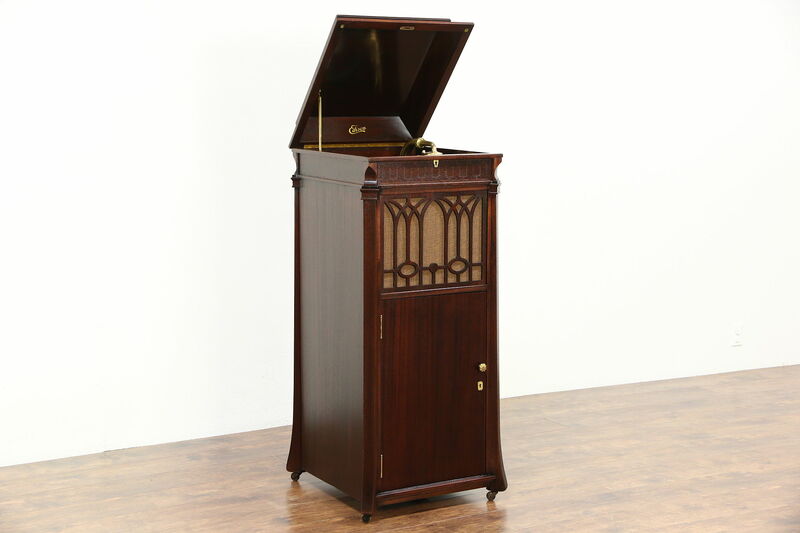 Signed "Edison Model C19," this wind up phonograph has a mahogany case and operates smoothly and quietly. A gold medal reads Diamond Disc Official Laboratory Model," this series with genuine diamond needle was produced from 1912 to 1929. The latest patent date is 1916, so it is after that. This top of the line record player has beautiful tone and gold plated mounts. The diamond needle plays only the thick Edison records, a group is included. There is a sliding "earmuff" volume control, speed and off switch plus lever drop cuing. An engraved plate gives the name of the original music store that sold this antique in Glen Falls, NY. Measurements when closed are 23" wide excluding the removable crank, 25" deep and 51" tall.